The Priority Pro delivers keynote presentations and seminars that help participants address a wide range of work, family and personal issues. Each program offers practical advice and strategies on today’s most prevalent work and life issues. Participants are engaged with Natalie’s clear, concise and candid speaking style. Natalie’s words have an immediate transforming effect on the audience. Programs typically run from 1-4 hours with ample time throughout for interactive activities, questions and answers. Formats include a 30-60 minute keynote address, a 1-2 hour workshop or lunch-and-learn program, or a half-day seminar. Virtual seminars (tele-classes) or webinars are also available to accommodate tight schedules and geographically dispersed audiences. • Presentations are impactful and relevant. • Workshops are highly interactive and eminently practical. • Seminars are completely customized to ensure maximum impact. • Keynotes consistently receive rave reviews. Natalie is an accomplished presenter who has conducted numerous programs on a wide range of topics including work-life balance, stress reduction, interpersonal relationships, motivation, team building, life planning, and change management. 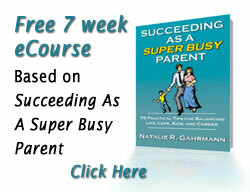 She is available to speak on any of these topics as well as any of the topics in her book Succeeding as a Super Busy Parent. To meet the unique needs of your organization or business–each of our seminars are customized according to your goals and objectives. The following is a sampling of the most popular topics currently available. An inspiring interactive presentation designed to empower you to reclaim yourself in your super busy life. You will be provided with practical and timely tips and strategies for increasing bottom-line results and personal fulfillment while decreasing your stress and feelings of overwhelm. You’ll have the unique opportunity to step away from your busy schedule, pause, regain control, and make conscious decisions about the life you would like to be living. A hands-on workshop custom designed to help you take better A.I.M. at your target so that you can improve performance and productivity. This program introduces the Priority Pro’s proprietary process for assessing, integrating and maintaining priorities. Overcoming Obsessive Distraction Disorder: How to Focus on your Work – Before it Costs you Your Bottom-line! Get a better handle on everything that robs employees’ time & attention – from what they’re actually being paid to do! Learn creative and practical strategies to help your employees eliminate distractions, manage obligations, and focus on the task-at-hand. An inspiring interactive presentation designed to motivate you and provide effective tools for better managing all the things vying for your time and attention. You will walk away with practical and timely tips for increasing bottom-line results. This presentation will motivate you and provide you with effective tools for better managing all the things you have to do. You will be equipped to move from juggling to balancing as a result of your participation in this program! In this dynamic workshop you’ll learn 7 essential factors for succeeding in today’s hectic world. You’ll examine ways to achieve more success, fulfillment and balance in your life. You’ll have the unique opportunity to step away from your busy schedule, regain control and make conscious decisions about the life that you would like to live. This seminar is an upbeat highly interactive look at stress, it’s causes and effects, and effective actions for handling it. In this workshop, you’ll learn more about stress and how to make it work for you, instead of against you. Learn effective behaviors for reducing stress by doing less of the urgent and more of the important. In this program, you will receive tips and tools to help you achieve success in every facet of your life. This lively discussion will help you examine your life, identify specific areas for improvement, and create goals and a game plan for getting where you want your life to be. In this dynamic workshop, you’ll learn the seven key essential factors for succeeding in today’s hectic world. You’ll examine ways to achieve more success, fulfillment and balance in your life. You’ll have the unique opportunity to set away from your busy schedule, regain control and make conscious decisions about the life that you would like to live. This workshop brings in principles from the speaker’s award winning book, “Succeeding as a SuperBusy Parent: Practical Tips for Balancing your Work, Family and Personal Life”. Natalie Gahrmann is available to speak at your next meeting or company event. Learn more about how to bring her informative and motivational presentations to your organization. Contact us at 908-392-7098 or email natalie@theprioritypro.com. Other programs are available. Customization is welcomed and encouraged to design a program to uniquely meet the needs of your audience. Contact The Priority Pro to discuss your program needs!